I have been trying to get with Schreiter for some time for an interview to discuss questions of mine that have arisen over the course of my own dialogue between theologies, (sub)cultures, and various religious groups. Following are my questions and Schreiter's responsive thoughts. Morehead's Musings: Protestant evangelicals are used to thinking about theology in terms of received historical theologies like Calvinism or Wesleyanism. Yet you describe a need for "local theologies." Why are these Protestant historical theologies examples of local theologies even if Protestants don't recognize them as such, and how do you define local theologies in terms of new expressions of theology in cultural and subcultural contexts? Robert Schreiter: Theologians of whatever denominational stripe or inclination think their theology works above or apart from the context because of its subject: God. But even those who affirm biblical literacy have to contend with the fact that the Bible was written down by finite humans. Take a look at the document that came out of the October 2010 Capetown meeting of the Lausanne Covenant. (Incidentally I have an article appearing on the mission theology of the Lausanne Covenant's three big meetings, appearing in April in the International Bulletin of Missionary Research). The theology of, say, John Calvin can be seen as local inasmuch as his writings were shaped by a response to a specific historical circumstance--reform of the Church in the 16th century. Local or contextual theologies are sensitive to context, but they are not determined by it. Nearly all Western theologians seem to have difficulty accepting the limitations of their formulations. I get requests all the time (especially from Europe) to talk about the "universal" in the "local" theologies. Morehead's Musings: Many evangelicals have been wary of sociology and have usually not brought it into dialogue with theology. 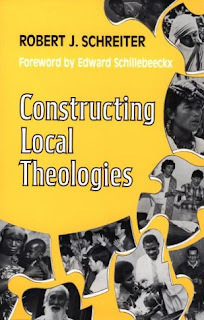 How might a sociology of knowledge be significant for local theology formation? Robert Schreiter: What I call a "sociology of theology" (that part of the book is widely quoted) is really built on a sociology of knowledge, i.e., a realization that all knowledge is situated, even as it reaches out beyond its situatedness. My point was to say that the location (monastery, university, oppressive situations) shape the form that theology takes. Another way is to look at theology's addressees: for whom is it intended, and what counts for them as genuine knowledge? Morehead's Musings: I have been impressed with the missionary work of Catholics historically, particularly Jesuits like Matteo Ricci. Were they involved in the development of local theologies as you discuss, drawing upon the cultural tools they had available to them in their time? Robert Schreiter: Was Ricci a local theologian? In many ways he (and perhaps even more, his contemporary Roberto de Nobili in India) was, albeit ahead of his time? Such local theologies arose when it became clear that the received theology Ricci and others were trying to transmit could not be understood or was regularly misunderstood by its intended audience. It is this disconnect that prompted the beginnings of contextual theology in the 1970s. It was certainly the reason I was drawn into it. Morehead's Musings: At one point in your book you state: "..in cultures where human growth is not seen as personal achievement, but as discovering the underlying and unchanging patterns of the universe and coming into conformance with them, wisdom theology will find a ready home. The ideal of a fulfilled human life becomes one where a conformity to those archetypes of existence is carried out. One thinks of the Greek concept of paideia, the quest of the alchemist, and the discovery of the unity of the atman and the Brahman in Indian religion in this regard." At another point previous to this you reference the importance of kinship to theology for other groups. Here I am thinking that the former insights would have great relevance in a theology for Western esotericism and Paganism, and the latter with Latter-day Saints (Mormons). While we might think of wisdom and kinship theologies as being relevant for the peoples of Asia and Africa, in the West aren't esoteric and Latter-day Saint theologies examples of the types of connections between various subcultural groups and local theologies that can be made? Robert Schreiter: One work you might consult is by the Roman Catholic theologian Elizabeth Johnson: her Friends of Apostles and Prophets which is on the doctrine of the communion of the saints. You will get some good connections by looking at what has been written on Christians' relations with the ancestors, especially in Africa and East Asia. Morehead's Musings: One of the greatest challenges for Protestants, particularly evangelicals with their concern for orthodoxy over against heresy, has been the fear of syncretism. But with this concern in mind you suggest that syncretism raises the question as to how serious we are about contextualization. With the lack of success in missions in Muslim, Buddhist, and Hindu cultures, it would appear that we need to be more bold and experimental in the formulation of local theologies. In this regard you write: "Is there a Buddhist way of being Christian, or a Hindu way of being Christian? Those two great traditions have been able to accommodate Christianity, but Christianity does not seem able to accommodate them." You then mention Christian "exclusivist thought patterns," and ask "Are those thought patterns essential to Christianity or do they represent certain cultural categories only?" How might those wishing to develop new local theologies that begin with the prisms of other traditions do so in ways that engage in healthy forms of syncretism, as religious studies understands the term (as opposed to theologians who view it as wholly negative). Robert Schreiter: Syncretism continues to be a touchy subject across most of the religious spectrum. Practice is outstripping theory on this one. Robert Putnam in his recent book American Grace found some 80% of average Christians (across the spectrum) accepting a "pluralist" position on Christ and other religions, despite the tenets of their churches. It seems to have grown out of the experience of the goodness found in believers of other faiths. I took up the question of syncretism again in The New Catholicity. On double belonging, see Catherine Cornille, Many Mansions? and Paul Knitter's recent book on how he considers himself a Buddhist Christian. Morehead's Musings: Thank you for your thoughts on these issues. I look forward to your IMBR article. Being an RCIA staff member of our local parish, I found Dr. Schreiter's take on local theologies very enlightening. I will definitely read his book (Constructing Local Theologies) in preparation for our next year sessions to help me form a dialogue with future converts coming from different part of Asian cultures. Don Rimer: Occult Expert or Merchant of Fear?